Our stay was wonderful. The place was exactly how it is described. 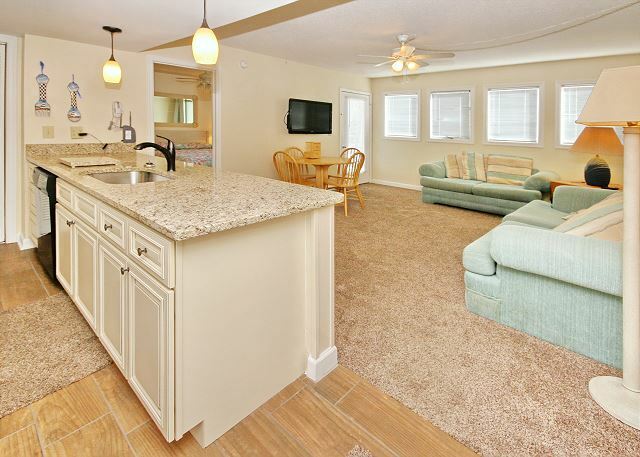 It is close to everything and walking distance to the beach. I would definitely stay again. Although we didn't do a great deal of cooking the kitchen appliances are first rate! The proximity to the beach is a short walk. We enjoyed the space which was very adequate with the twin and bunk beds. My family had a great vacation. We enjoyed the different pools and lazy river. 'BIG' family annual beach trip! We have been vacationing at Myrtle Beach Resorts for about 15 years. We typically rent 6-7 condo's for our family of 24+. We LOVE this courtyard and the first floor rooms are exactly what we need. The pool is RIGHT there for our grandchildren (8 in all), the additional grills installed this year made our cookouts much easier and the new composite picnic tables work great for us! We've already booked our 2019 week and can't wait to come back! This unit was not as nice as the pictures for sure. The whole Resort is dated but this unit was much smaller than advertised, the linens were stained and old. The walls are so thin we could hear conversations and more from our neighbors unit. Not a place we would return to for a relaxing vacation. Thanks for your review. We would disagree. The unit is exactly as the pictures indicate. I wish we had known about the stained linens while you were here, as we would have certainly replaced those for you. But we never heard from you about anything while you were here. Enjoyed our stay. Everything was as described no surprises. We definitely will book again. My family had a great time. Can't wait to come back next year. We loved our condo. It was perfect for our large family. There were some minor issues with one of the toilets but nothing that made it operational. There was a ton to do and kids never got bored. We will definitely be back! This is our 14th year at MBR and the first time that we have rented from Myrtle Beach Management. It was a well equipped, clean and comfortable condo. Highly recommend it to others. We have stayed at several units within this courtyard at MBR for the last 14 years. We are referred to by the owners as 'the Big Family'. This year our BIG family rented 4 units but in the past we have rented as many as 7 units, all within this courtyard. WE LOVE IT. With 20 some people we tend to cook out on the grills each night and eat on the picnic tables. This year we were pleasantly surprised to see 4-5 new picnic tables to enjoy! If you're looking for ocean view, you won't find it here. Although they call it ocean front, these particular units are not on the ocean. HOWEVER, we have always kept one car parked near the ocean with all 20 chairs and 6-8 umbrellas so as to not have to drag them the 1/4 mile or so back to the condo. It has worked for us each and every year! Within this particular courtyard we have an indoor/outdoor pool, sauna & hot tub which works out great while we're grilling/cooking and kids are entertained in the pool. Did I mention we LOVE this place??? As for this particular unit, this was our first year renting this unit. 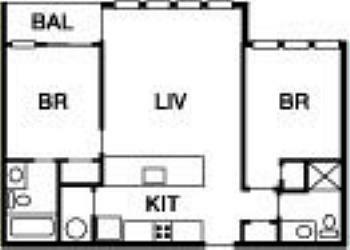 It is the only one of the 8 different 2-bedroom units we've rented with beds in the second bedroom for THREE kids! This was perfect for our daughters family of 5! Each unit is privately owned so the interior is different in each one. Some owners keep up with interiors better than others. This one was just fine! I would definitely recommend this property to my friends and relatives! Easy to book and management company was easy and accessible. The property as a whole is beautiful and full of amenities. Several pools, tennis courts, playgrounds and grills all ion a family oriented setting. Of course easy access to the beach right out front. Our rental unit was dated and could use to be spruced up a bit. It was clean, but not spotless. We traveled with our two kids and my nephew and niece and spent a week here. The six of us were quite comfortable in the 2-bedroom condo. The units are a little dated, but clean. Only the indoor pools were open when we were there, one of them closed for half the week for maintenance, but the water park looks like it would be a blast in the warmer months. The location great. It's practically next door to the Myrtle Beach National Parck. It was 10-minute drive to the Myrtle Beach strip and just a little further to places like Huntington Beach National Park and Brookgreen Gardens. It's a big property with many buildings, and right on the beach. No laundry in the unit, but one in each complex. Pat at the rental agency was great and they were very flexible with some last-minute changes we had to make. I will start off with saying the lazy river and indoor and outdoor pools were great except they weren't cleaned the entire week we were there. There was leaves, hairballs, worms etc on the bottoms of every pool we visited and the lazy river. The condo itself would not have been comfortable for our family of seven. We had two family members back out at the last minute but the beds, furniture and space was cramped for the five of us who did make it to the vacation. The stove was very small as was the oven. One barbecue grill in the courtyard was unacceptable for several units to use. Parking is horrible. The shower curtain in the master bathroom had mold growing on it. The futon sofa had been repaired in the past because several slats were missing and oddball boards had been added. The pools and hotubs, etc., neing locked up for am hour after every lightning strike seen on the main road was a bit much though. Security was great. I will never recommend this resort to family and friends nor will my family ever stay there again. It's hard to respond to numbers. If you were this dissatisfied, maybe a phone call to us would have allowed us to fix the problem(s). I was surprise that the pools were open, that was great! The pools and grounds was clean. Kids enjoyed the stay. overall very satisfied. Would have liked some more info on beach umbrella rentals, restaurant bar upon check in. Also surrounding "things to do" list. Had to investigate on our own. The security did well to correct s noise problem. The beach was pristine and enjoyable. Loved it, plenty of room for what we needed!! We loved this location! The back yard was relaxing and we had quick access to everything! We have been coming to the resort for 7 years. This was a great, like new condo. Loved it!! I have been to the Myrtle Beach Resort before, but this first time to courtyards. Very pleasant location, close to pool. I stayed here for a week in September with 3 others. The condo was clean, although we did see a roach in the kitchen. The linens were already on the bed, and we had several towels in each bathroom. I would reccomend bringing some extras, though, as we used up the towels fairly quickly. The beds were fairly small in the guest bedroom, and the master bedroom is mostly taken up by the large bed, but we were all comfortable. The furniture in the living room was great - everyone enjoyed the couch and the chair, and the TV is a flat screen with an HDMI port. There were some left over beach toys (a bucket, a few boogie boards) on the porch that we made use of. Probably left by another guest, as they were all used, but was still fun. The walk to the beach is not far at all, and although parking is a little tricky (you have to turn left almost right after entering the complex and then drive up a one-way street to park) there were usually spots right in front of our building. The front gate attendant was a little rude, but other than that all of the staff was pleasant and accomodating. We really enjoyed our stay. It was well worth the money we paid, and I would definitely consider this for our vacation next year. It's not cush by any means - there were some stains on the carpets, etc - but you get what you pay for and the place was nice and accomodating for our party. We had a nice vacation. The property is closed to the beach and it was not very crowded. We had a great time at the resort. We grilled out several times for lunch at one of the various grills located on the premises. We had a great time enjoying the lazy river, hot tub, and pool. We enjoyed the newly installed shaded areas around the pool. Great for when we had had too much sun for the day but did not want to go in. Other than the M&Ms under one of the beds the condo was clean. The door to the patio stuck often and we thought we had locked ourselves out a few times. We just had to push a little bit harder. This could probably be easily adjusted. Parking was easy to find compared to staying in A or B building like we have in the past. Nice walk out with no stairs or elevator to wait on. Was good value for the money. A second stay in 5 years and still great! Other than the extremely loud bathroom fans in each bathroom of the unit we stayed in, the rest of the weekend was wonderful! The condo was cute and very practical. Beds were comfortable. Bathrooms were clean. The indoor pool and hot were lacking TLC but the outdoor pools were fantastic! We had a great time and the Resort is very nice. The staff on location are very courteous. We will definitely come and stay at this Resort! Fun times for the kids!!! This was the perfect getaway for our 3 excited young ones. There was plenty of action happening around the various pools and even more fun to be had on the tennis courts, playground, and courtyard. The room was clean and spacious. Had a terrific time! Very awesome place!!!!! I will deff be back to visit this resort! AWESOME place to stay! i would recommend this place! In-door and out-door pool with lazy river, mins from ocean front!!! Hot tub !!! !